Happy Tuesday! Anybody else ever struggle with finding time to take photos?! My husband takes most of my photos, and finding time when we are both available has been so difficult hence the lack of posts lately. I’ve been waiting forever to post this sweet off the shoulder dress. I’ve had it on repeat all fall. 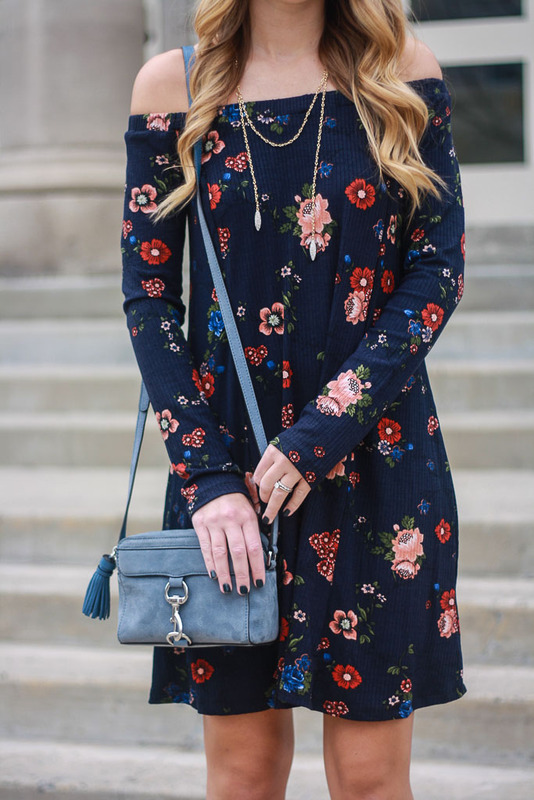 I love the pretty fall floral tones and that it’s long sleeve. I’ve even worn it to work with a chunky knit sweater, tights and boots. Friday is definitely my favorite day of the week. I love knowing I have the weekend ahead of me and get ridiculously excited about sleeping in (anybody else feel the same way?). I wore this dress over Labor day weekend. I felt like it was the perfect little number to celebrate the end of summer, with it’s vibrant red print and midriff cutouts! The thing I love most about this dress?? It’s $20! The quality is actually amazing for the price! I am wearing a size medium for reference! 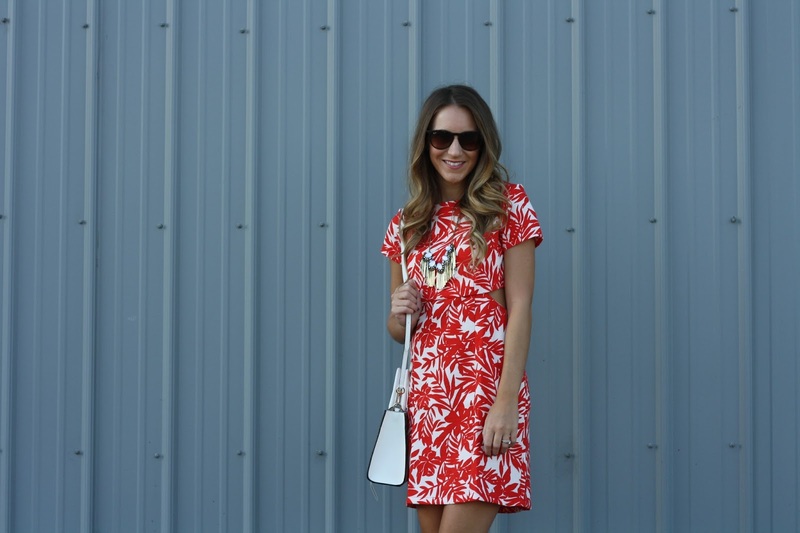 If you haven’t already noticed, I have been living in florals lately, and the brighter the better!! This romper is SO cute! I love the fit and the the waist tie that really pulls the outfit together! I am wearing a size small and at 5’3, it really is just the right length for me! The best thing about this romper? It’s under $25! This is definitely a piece to wear now, and to wear with a cargo vest or jacket and booties in the fall! This month, I have challenged myself to not buy anything new and get better at shopping my own closet. This can be the extreme challenge for those of us who love to shop (hello, my fellow shopaholics), but I was excited to pull out some pieces that hadn’t seen the light of day in awhile (and to save some money after the damage the Nordstrom sale did to my wallet last month). This top was one I picked up at Forever 21 a few years ago, but you can get the look by shopping some of these fabulous floral options here. Typically, Forever 21 pieces are not ones that have a very long closet life, but I was still drawn in to the bright floral print and flowy fit, so this one continues to make it past my closet purges. Pairing it with my favorite scallop hem skirt was a must. The bright yellow and blue really popped against the crisp white! I kept things fresh by adding my favorite white crossbody and my Illesteva sunnies courtesy of Ditto. If you haven’t heard of Ditto, you are missing out!! Probably my new favorite subscription service, Ditto allows you to try out new sunnies for just $19 a month! This is the perfect solution to those who love to change out your sunglass style often or if you are in the market for a new pair but are not sure of the style you want! Try Ditto out with the code ‘TWENTIESGIRLSTYLE’ for your first month free!